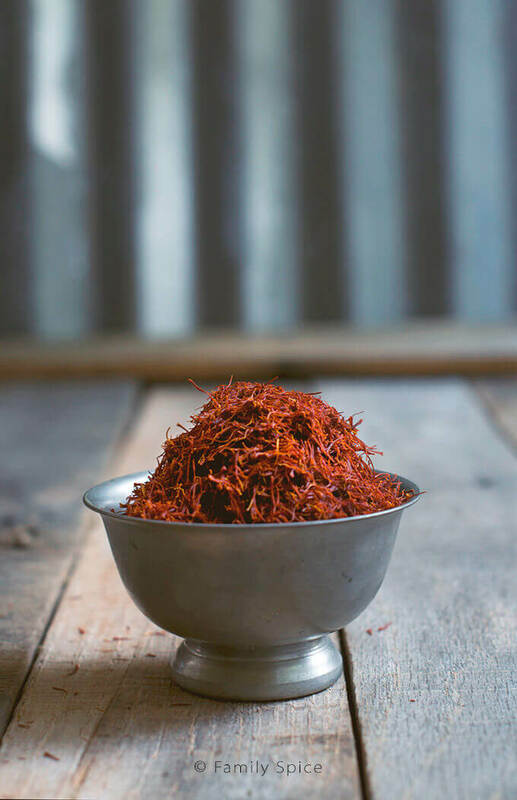 This article tells you everything you need to know about saffron: from cultivation to choosing saffron and even saffron recipes. Saffron. This exotic spice evokes images and scents of far and exotic places. Outdoor markets, or bazaars, filled with dates, nuts and tea leaves. It’s deep red threads yields a gorgeous and rich yellow color when soaked in hot water, making it a wonderful natural dye. But, it also carries a distinct aroma that reminds me of sweet family traditions dating back hundreds of years- culinary traditions I hope my children will continue and pass down to their children. 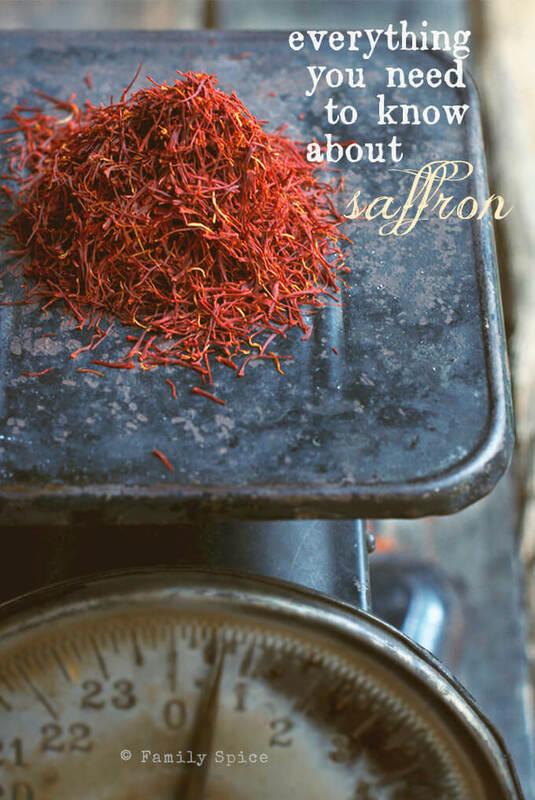 My goal for this post is share with you everything you need to know about saffron. 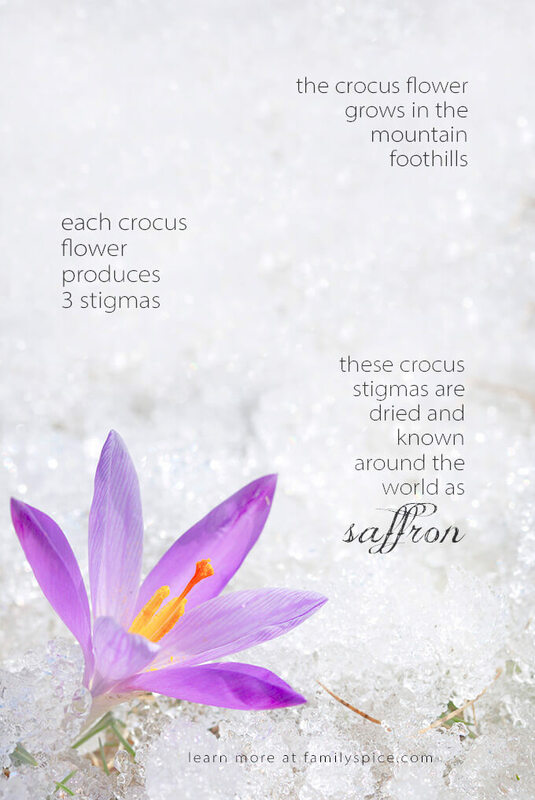 Did you know that saffron is a spice found from the crocus flower? Specifically, those threads are the three red stigmas inside the flower. It is native to Southwest Asia, but was first cultivated in Greece. Cherished in Iran and the middle-east, saffron is also widely used in Spain, Italy and the rest of Europe. Just like diamonds, saffron’s quality is graded and there’s even a number scale. 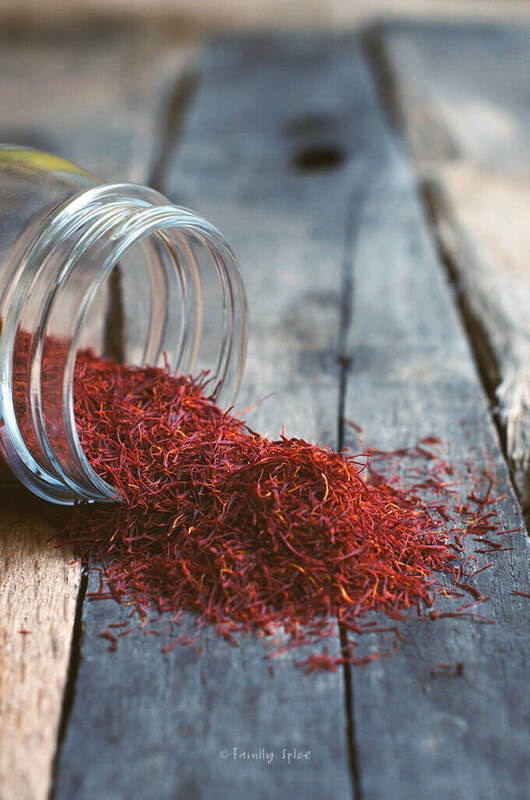 For the best quality of saffron, choose saffron threads (not powder) that are dark red. Persian saffron have the most intense color and aroma, especially when compared to the more mild Spanish saffron. Why is saffron so expensive, more expensive than oil or gold? I’ve seen saffron in gourmet food markets sold in tiny glass bottles for as much as $20 for about 10 threads. The crocus flower requires specific weather conditions for it to flourish. And with the different varieties available, the best quality saffron is found in Kashmir and Iran. The crimson stigmas are hand-picked, collected and dried for distribution. Remember, each flower will produce only 3 threads of saffron. That’s it. Not all saffron is over priced. 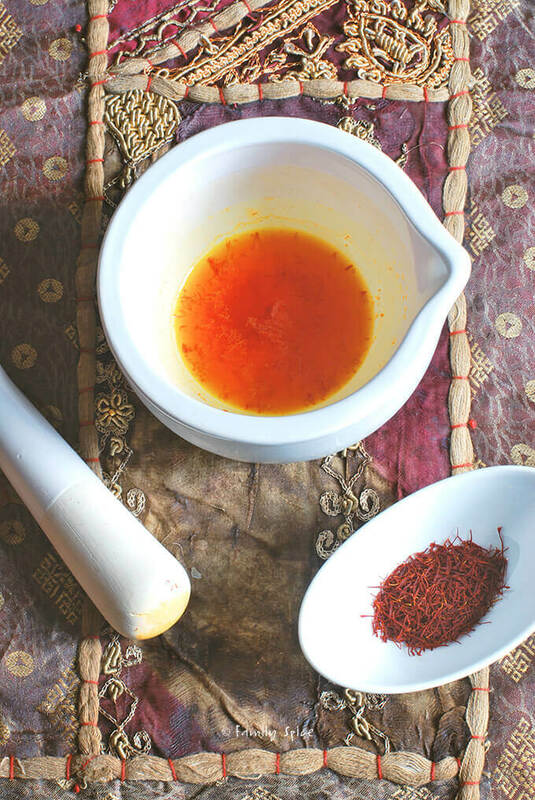 Did you know I sell saffron here on my blog for $8 to $25, varying on quantity. When purchasing saffron, you can also purchase crushed or powdered saffron. It is less expensive than the full threads, but the quality is always in question. Ground saffron is typically mixed with turmeric and paprika. So you might get the vibrant golden color you desire, but you won’t get the true flavor and intense aroma found only in pure saffron. Recently, I found Spanish saffron sold at Costco. It’s grade set at 230, and you can read Wikipedia’s explanation of the grade system here. I’m truly blown away by the swell of popularity here in the U.S. for this illustrious spice. The best way to store saffron is in an airtight container and in the dark. I keep mine in my pantry. My mother-in-law likes to crush a bunch of saffron and mix it with a small bottle filled with warm water. Once it cools, she stores the bottle in the freezer. She likes to make it a high concentrate of water and saffron so when she needs it, she takes it out of the freezer and adds a bit of warm water to it. Since you only need a teaspoon at a time when cooking, you pour out what you need and return your bottle to the freezer. This is an easy way to store your saffron when you use large quantities at a time, like we Persians do. Italians use saffron in risotto. My blogging buddy Wendy at The Weekend Gourmet has a fabulous Risotto alla Milanese you have to check out. My pal Jenni Field from Pastry Chef Online shows you how to make Ottolenghi’s Saffron Crackers with Citrus Fennel Sea Salt. Paella is a classic Spanish dish that features saffron and Sandi from Fearless Dining shares her easy gluten free paella using brown rice. 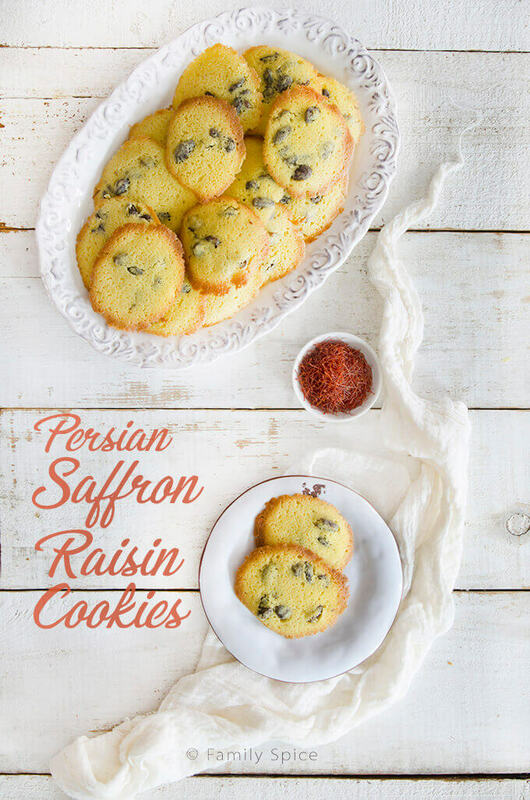 And another great friend, Beth over at OMG Yummy, shares my love of saffron as well as her favorite Tasting Jerusalem recipes using saffron. Of course I use saffron all the time in my cooking, too. Here are some of my personal recipes that feature my favorite spice, saffron. Saffron is an exotic and aromatic spice that can be used in a number of different recipes, both sweet and savory. 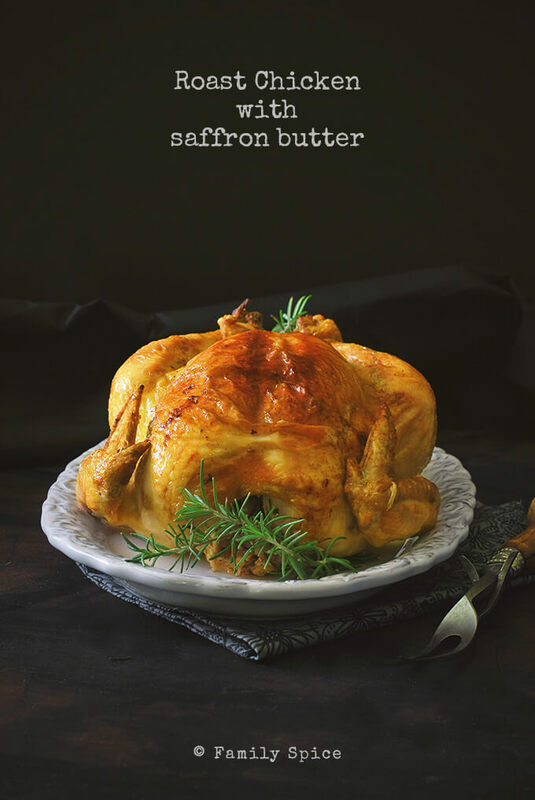 This roasted chicken gets it’s golden color and fragrant flavor from baking in a saffron butter glaze. 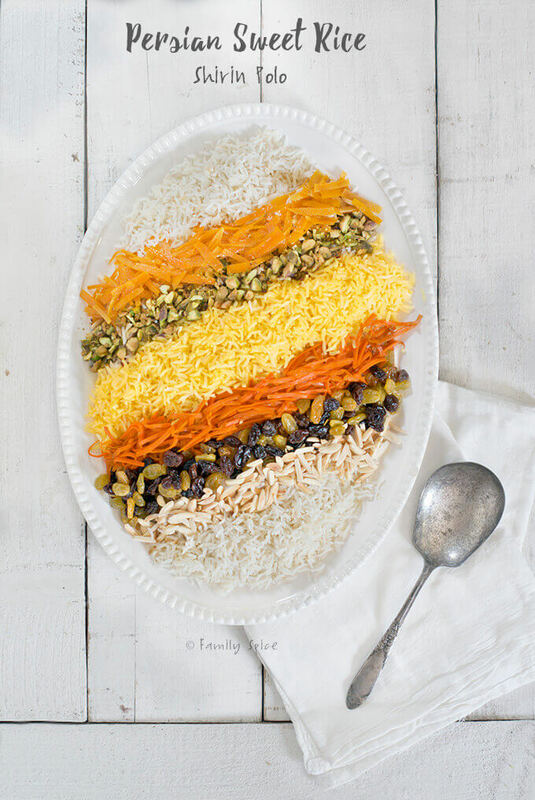 Shirin Polo is a Persian basmati rice dish traditionally served at weddings and other social occasions. Studded with candied carrots, orange peel, raisins, almonds and pistachios it makes one beautiful meal or a unique side dish to chicken, fish or any roast. It's easy to whip up foodie holiday gifts from your kitchen. 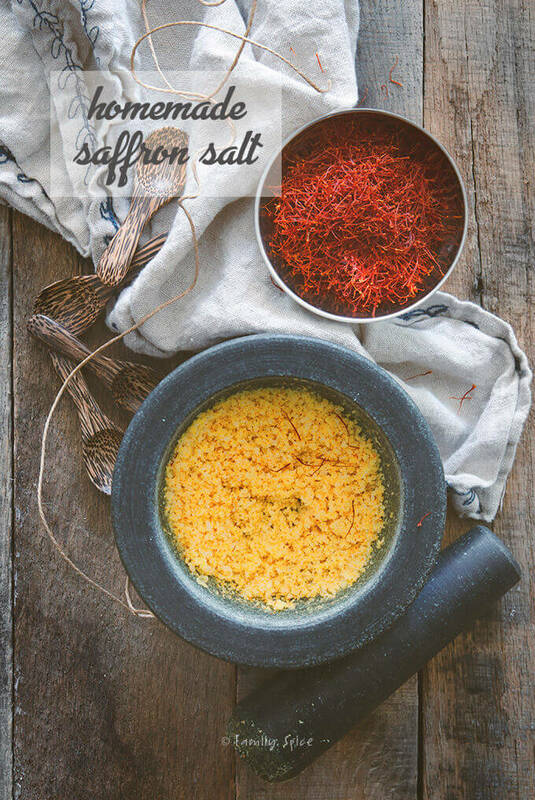 Grind up sea salt with saffron to make some golden saffron salt or dry up fresh garden herbs for homemade spice packs. The Persian kuku is similar to a quiche, but is a little more dense. 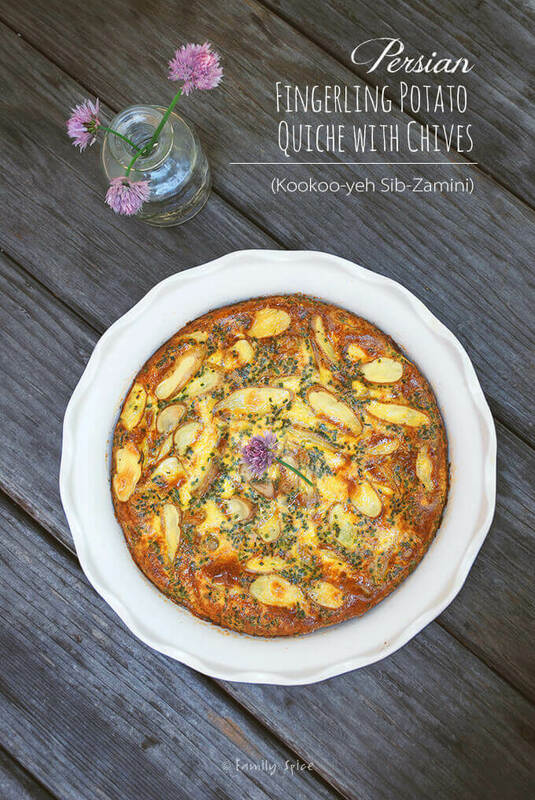 This recipe for Persian Fingerling Potato Quiche with Chives (Kookoo Sibzamini) is a twist of the traditional Persian version and uses sliced potatoes instead of mashed. Add a touch of gourmet with a very simple ingredient. 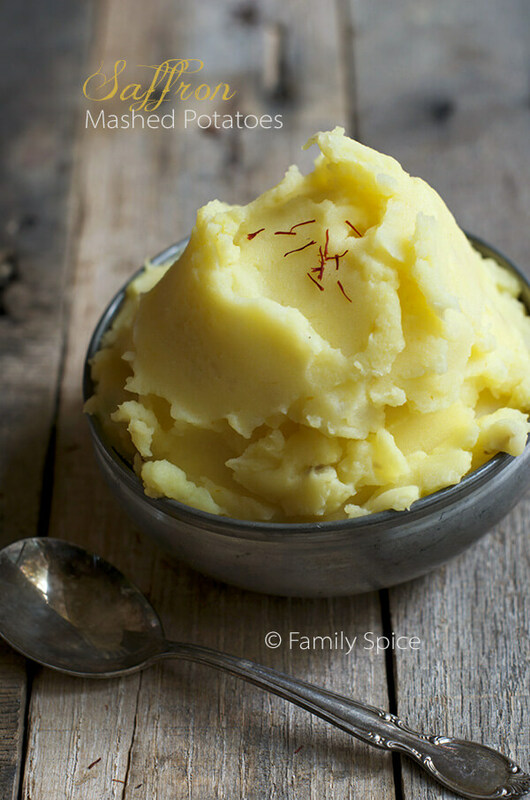 Whip up some golden Saffron Mashed Potatoes for your next meal! 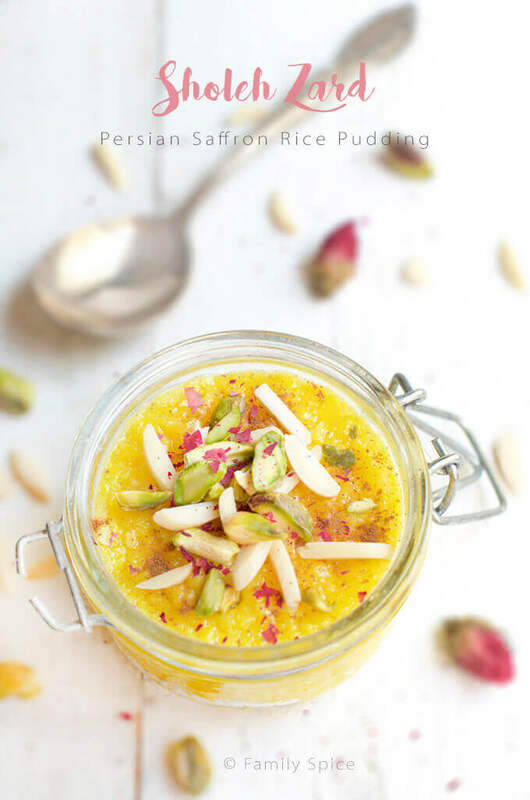 Sholeh Zard is a Persian saffron rice pudding made with basmati rice, sugar, rosewater and saffron. It is garnished with cinnamon, pistachios and almonds. Fresh ground saffron is not just for paella! 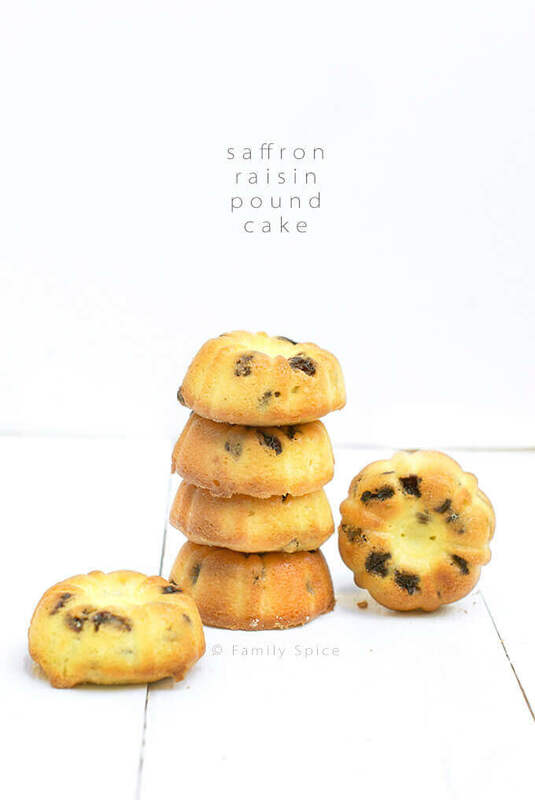 It makes this buttery saffron raisin pound cake aromatic, exotic and delectable! 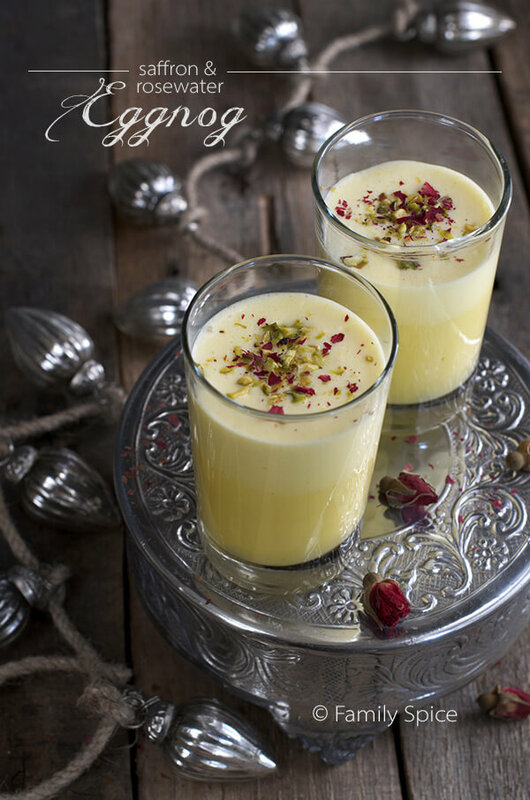 Share these special holiday moments with this eggnog with saffron and rosewater and tastes just like decadent Persian ice cream! 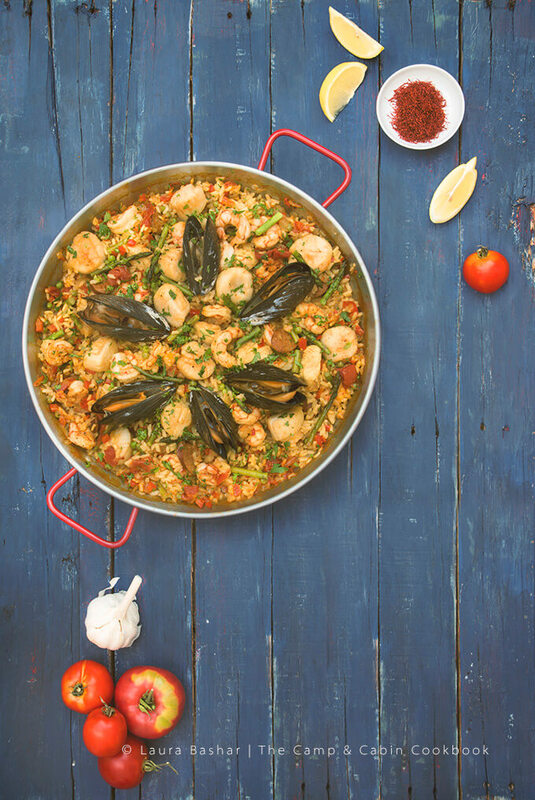 I have also featured saffron in a delicious seafood paella prepared over the campfire. 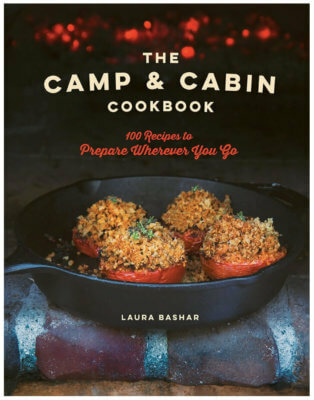 This paella recipe is featured in my cookbook, The Camp & Cabin Cookbook. 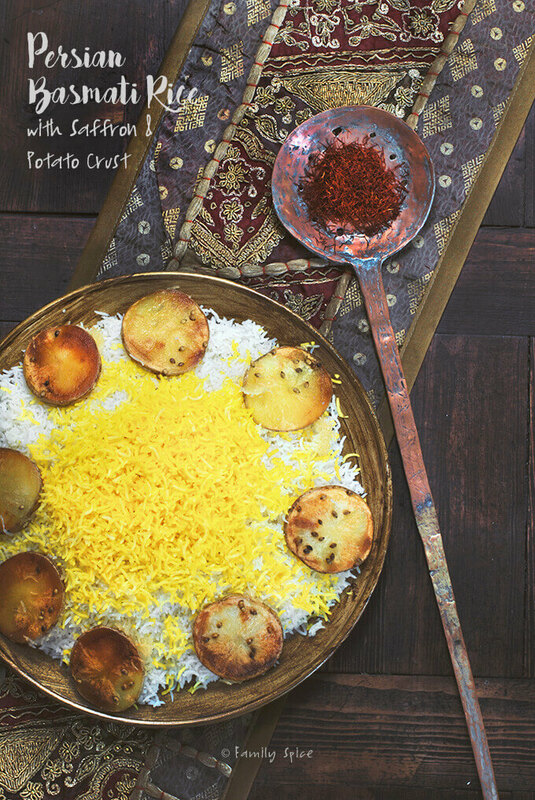 I have also featured a recipe with saffron in my first cookbook, Cooking Techniques & Recipes with Olive Oil. 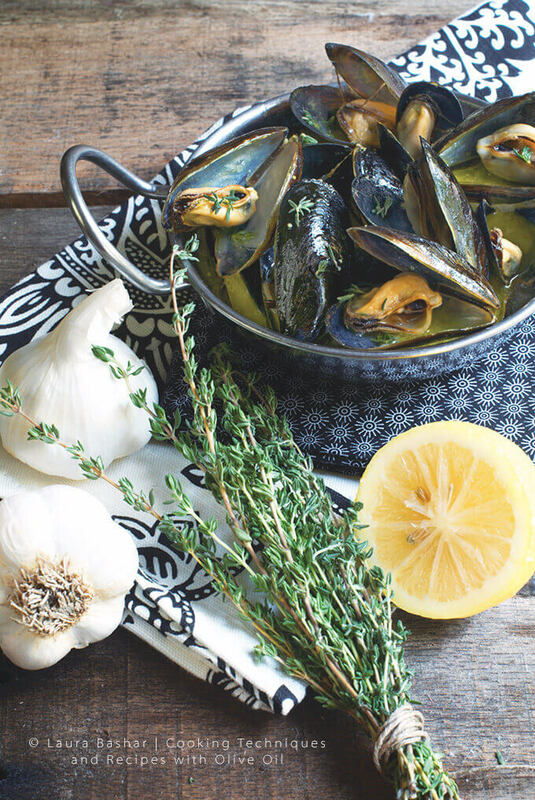 A bowl of Steamed Mussels with Lemon Saffron Broth and a baguette sounds like the perfect meal to me! So there you go – basically everything you need to know about saffron. Sign up for my newsletter and you will receive my FREE saffron ebook! Hi Laura. I always love to support your website! I have referred lots of friends and plan to continue to refer friends to your website. I went to the stumble site for the 1st time and left a msg about your site. Hopefully, you will get some more followers! I have never cooked with saffron but would love to try it some day. I know you have answered questions in the past for me about it. Jennifer, you rock, as always!!! Thanks for your love and support! Wonderful link, I lookd forward to trying your recipes! Especially the saffron ice cream. My last name is a derivative of the name Saffron – I use it to make delicious rice pudding (throughout every fall/winter) and paella, which I'm long overdue to make. Awesome site! I,ve heard that Saffron this year is half the price from last year at least here in Scandinavia, good harvest. Hi Laura, I just found your blog and I absolutely love it! Your recipes seem to be delicious and your photos are beautiful, and I already tried your pomegranate peeling technique and it works! So I subscribed to your blog and started following you on FB and TW, but that's not because of the giveaway (even though I would really love to win that saffron 😉 ). And I also added your blog to my Favorite Fodd blogs board on Pinterest :-). See you soon! Found you from Nancy, Love the saffron ice cream, being Italian I'm used to it in risotto, but I will have to keep that ice cream in mind. Nice to find you. I've never cooked with saffron. I've always wanted to. I was not aware of saffron ice cream but am very curious to try it. I enjoy following you on twitter. I book-marked many of your recipes last week. Yum. I follow u on twitter too and have tweeted about this giveaway ! First, I just wanted to tell you, your photos are breathtaking!! And I stumbled it! Whew… maybe I should've put all of this in one comment… 😉 Thanks, Laura! This is a wonderful post about Saffron and I knew some facts but not this details. I enjoyed being educated about this beautiful spice! You have so many recipes using saffron! Even ice cream!! I'm already your facebook fan! I already subscribe your feed. I used saffron for my Easy Paella (maybe not so traditional style but that's what I've been making), Bouillabaisse and….I think I also used for something else too…sorry but I can't remember for now. 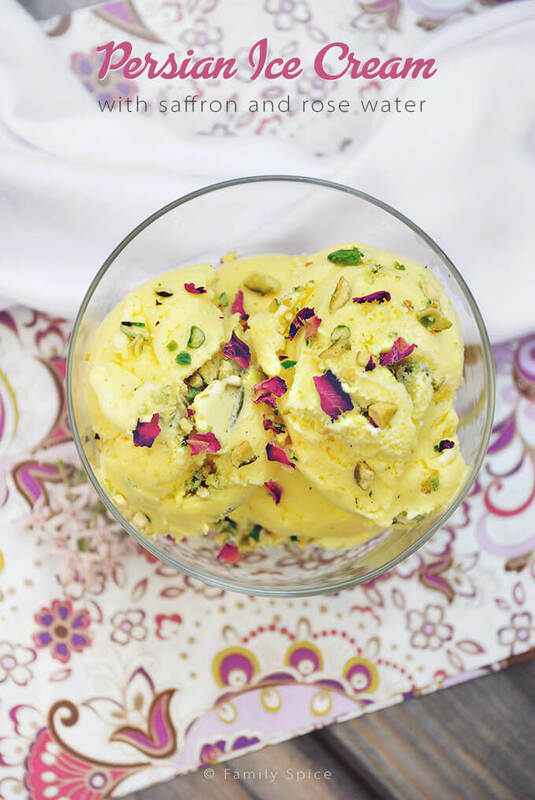 I had not idea that saffron could be used so many ways, like in ice cream! Yummy! I already follow you on FB. I love paella, of course with saffron! I signed up for the Family Spice newsletter. I've never used saffron before but the foods look delicious! Thanks! can't wait to make that ice cream! I cook often and had no idea Saffron was more than just a flower. Awesome blog and thanks for the ideas! I will have to keep my eye out for some Saffron and give it a go. I have never cooked with saffron, but your recipes look great and would like to try them. I'm a fan on facebook. I've never cooked with saffron, but a couple of things I'd like to make are your basmati rice and Scandinavian-style saffron buns. Hello Laura–I started suscribing to your feed last week and passed it on to a couple of friends. I've always wanted to try cooking with saffron. I never knew it was used for both savory and SWEET recipes! Have never used saffron but have always wanted to make paella. I am a steady reader of your site and really enjoy your recipes. I have never cooked with saffron myself, though I've had it in paella and in saffron-pistachio ice cream (so delicate, so good). It's not ice cream season for me now, though, so I'd love to make the tomato, saffron, and roasted garlic soup from the Fields of Greens cookbook. It sounds wonderful. Lovely blog, by the way – I found my way to it via the pomegranate vodka! Saffron creme brulee!!! The best. I have not cooked with Saffron because I have no idea where to purchase it. Bombay Bazzar did not have any when I was there. I look forward to cooking with it. I love your recipes and have made your Sholeh-Zard several times. I wanted to leave a comment under the recipe, but there doesn’t seem to be a place to do so. Just wanted to tell you that I’ve made it several times, and I think the sugar can be count down to one cup or less. I know you are concerned about your family eating healthy and just wanted to let you know that it’s equally as good with less sugar! Thanks again for sharing your fabulous recipes and pictures! I just noticed you live in San Diego…wow, what a coincidence. Lucky you! So far it’s my most favourite city I’ve been to in the States. That’s wonderful! Welcome and I am definitely going to do another saffron giveaway this December! Excellent post, my favourite dish is the chicken kebab – over a charcoal fire of course ! One question, would you use Persian saffron in Paella or would you use Spanish saffron since it is a Spanish dish ? I would use a Persian saffron because I am biased but I am interested to know what you think of the difference between the two ? I love saffron in Swedish Lucia Buns!! They are wonderful! Are you making chicken kabob? 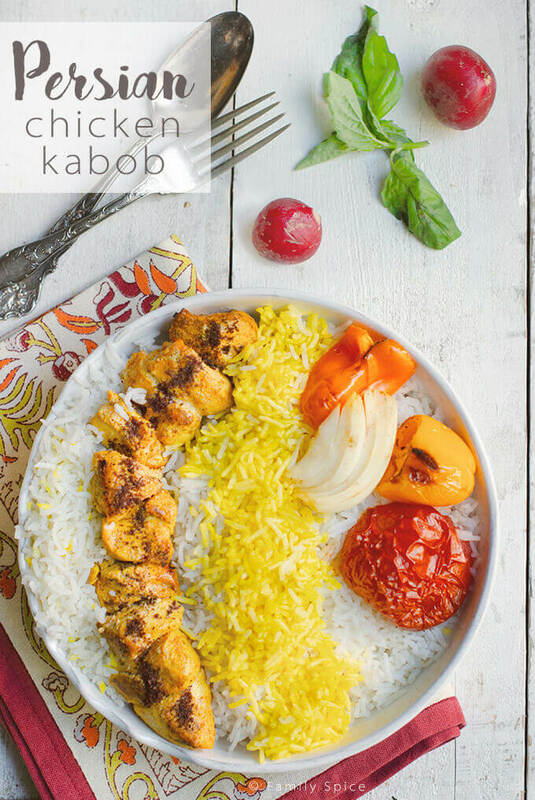 I have a recipe here that tells you exactly what you need: https://familyspice.com/persian-chicken-kabob. 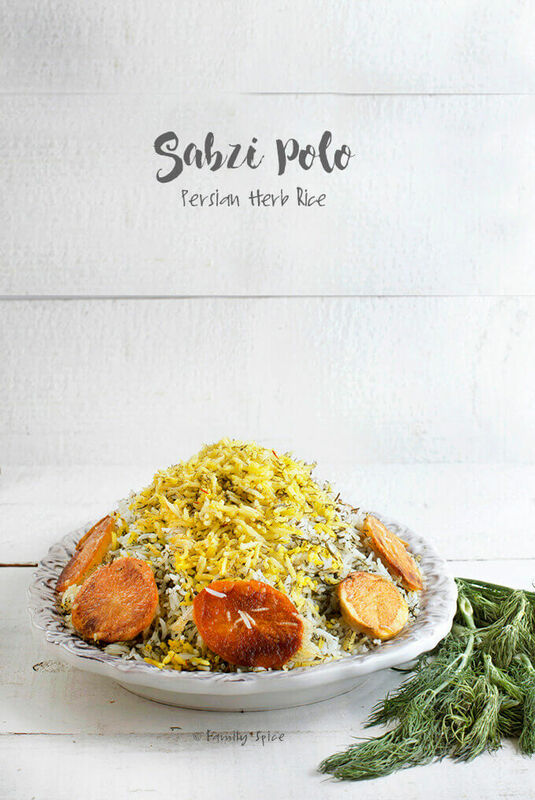 And for the rice with saffron, the recipe is here: https://familyspice.com/how-to-make-persian-basmati-rice-with-saffron-for-sundaysupper. You typically only need a pinch of high quality saffron for these recipes. Then I crush the threads in my mortar and pestle and add hot water. Thanks For Such A Nice Article Indeed saffron makes It better I My Self Is indian Based Saffonier.Can You Tell Me what Type Of Saffron It is Kashmiri saffron Or Persian Saffron? ?